This option will be held for two weeks from the date of this email. To confirm the booking we require a non-refundable deposit equalling the amount of the first night. Final payment and numbers need to be forwarded to base Backpackers 4 weeks prior to arrival. Cancellations or room reductions within 2 weeks of arrival will be 100% non-refundable. Located just around the corner from Welly’s nightlife and within walking distance of central attractions and amenities, Base Wellington showcases the vibrancy of Wellington with the bonus of comfort and convenience. With the city on your doorstep and such great facilities including 24 hour Free WIFI in our reception area, Base Wellington is the perfect place to stay. 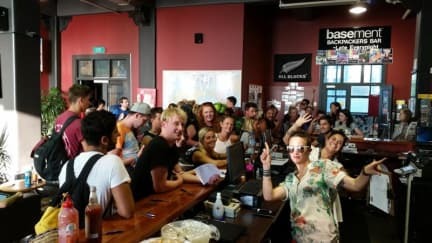 Down in our Basement Bar guests are invited to jump on our Bar Crawls, Beer Pong and Pool Tournaments, participate in our one of a kind quiz night, belt out ‘Hips Don’t Lie’ in our Karaoke nights, and if that won’t get them moving our resident DJ will. There is an event for everyone but while you’re waiting for the mic to drop you can enjoy a delicious meal bar food menu. Our reception staff are not just friendly faces but experts in travel and experiences across New Zealand, Australia and Fiji, so if it’s a Lord of The Rings Movie tour, a Ferry ticket or island hopping in Fiji you’re after, we've got you covered! Te Papa Museum is New Zealand's National Museum, offering visitors a unique and authentic experience of this country's treasures and stories. Wellington Botanic Gardens: Catch the cable car up to this unique landscape with protected forests, colourful floral displays and views over Wellington city. Carter Observatory: Located in the Botanical Gardens, it has a planetarium, static displays, plus a range of telescopes, all available to the public. Cuba Street Markets, on every Friday and Saturday night brings you the flavours of Wellington. A cultural mash up of delicious food and quirky stalls accompanied by some great tunes. Sunday Farmers Market, just a short 3 minute walk from the hostel next to Te Papa museum is the Sunday Farmers Market filled with gorgeous fresh produce. Mount Victoria Lookout: walk or ride up the hill and enjoy magnificent 360 degree views of the city and harbour. Nice place in a good location, there are no lockers but there are storage spaces under the bunks and you can store your stuff with the staff for $3 per day so pretty good accommodations! (Free) wifi is only available in the lobby which is a bit of a nuisance but work-around-able. Lovely staff, great central location. Bathroom was huge and with lots of storage room. Bunk bed was a little noisy with movement. Really decent stay overall. Great stay. Staff could be a little nicer (I hate when people chew gum while talking to me). Very central location and overall great hostel. It's very large and there aren't any lockers in the rooms. But it's very clean, they offer good specials and the staff is very friendly and helpful. Good location in the city, nice room (female 6 person), have to pay for wifi in the rooms though. Decent place for the money. My friends in a mixed dorm had a room that was not nearly as well kept as the female dorm. Bathrooms pretty clean. Overall i would stay here again. Good place to stay, key cards deactivate when near your phone however which can be irritating. Base is affordable, base-ic (haha) accommodation. Fine for a short stay. Area and hostel are both very noisy. Facilities are clean! Wifi costs, but isn't expensive. Not a lot of outlets in the room. Big issue was how uncomfortable the beds were. It felt like sleeping directly on the springs. It was warm, so I ended up sleeping on top of my duvet as a sort of mattress pad, and using the sheet as a blanket. Rooms are okay, and the bathrooms are clean. But I found the kitchen was always a mess when i was there and the lounge area was under construction. 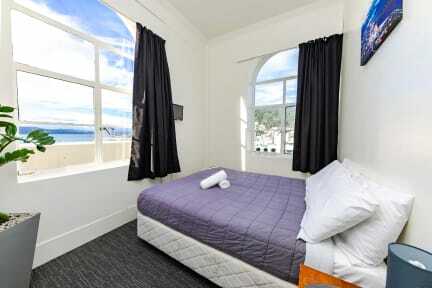 Good location- close to Te Papa, bars and shops. Very party oriented stay, with lots of party/drink deals. Luckily the rooms are very soundproof, so you can get some sleep.